Last week I was lucky enough to go on an adventure with the Save the Harbor Summer team to the lovely and mysterious Spectacle Island as part of Staff Training Week. This Boston Harbor Island is FAMOUS for its fantastic trash. If you are confused about exactly HOW trash can be fantastic, rest assured, skeptic, I'll explain. Amidst the cobbled shore of Spectacle Island, treasures lie among sand and rocks, waiting to be discovered: sea glass and marbles and china (Oh My!). As the summer staffers scrutinized the sand, we found a wealth of funky objects with interesting stories. Relics from the yesteryear presented themselves to our fingertips. Industrial materials from a 1930s New York manufacturing company, a porcelain -colored, six-faced die from Japan, and a fully- intact miniature glass bottle from 1920 emerged from the sand. These intriguing discoveries sparked questions and concerns about TRASH and TREASURE: Where did these items come from? Did our predecessors consider these amazing objects little more than rubbish? What happens to OUR trash? What TRACES will OUR GENERATION leave behind? to clean up some plastic refuse littering the beach, we pondered these thoughts and learned from his example. 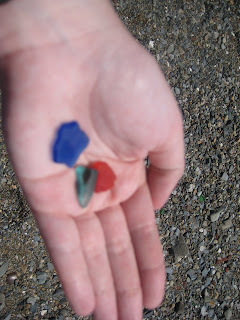 We silently decided that we'd rather be remembered by marbles and sea glass than by plastic bags and styrofoam junk.